MMR - Monthly Recurring Revenue - is the lifeblood of your Software or Subscription company. Striking a balance between attracting new customers and preventing churn is a company goal that transcends departments. Managing your recurring revenue stream requires a mastery of sales, service and finance. In order for you to improve customer retention and watch your business grow, you can count on Business Solution Partners to train, explain, and advise you on the ways in which you can manage your recurring revenue. We help companies find new ways to attract prospects, engage opportunity and delight customers, and provide the financial solutions to manage your recurrent revenue streams. 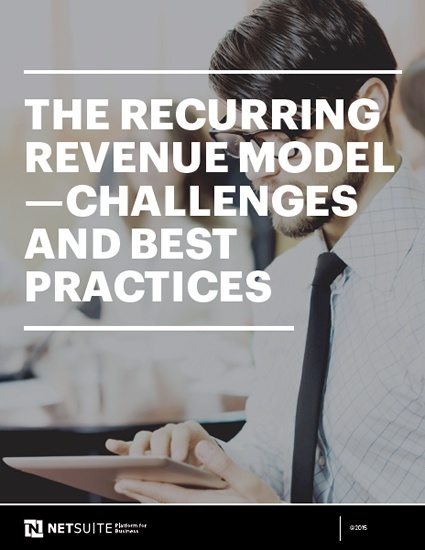 Download Our Whitepaper On The Recurring Revenue Model From NetSuite Now! At Business Solution Partners, our strategic insights on recurring revenue models help clients attract more prospects, develop better pricing structures, enable bundling for up-sell opportunity, and better tap into the potential of Recurring Revenue Streams. For over thirty years Business Solution Partners has been helping companies manage recurring revenue. From solid accounting and marketing advice to our deep systems and process knowledge, we can help you better manage your repeat customers and subscription buyers. Our focus is on bringing clients into the future with cloud-based software and modern strategies. Attracting new customers is not the only way to manage your recurring revenue strategy. We can help you think beyond the fundamentals of billing, invoicing, and collecting revenue to truly gain more insight into the ways you can take charge of your recurring revenue management solution. At BSP, we use NetSuite’s Recurring Revenue Management integrated order processing system. This system informs clients when they need to invoice, post revenue or approach the customer about renewals. Enhance your business’ financial position with Recurring Revenue Strategies and Technology Solutions with Business Solution Partners. Business Solution Partners are HubSpot Certified Platinum Partners and much of our work on the platform centers on recurring revenue strategies. We help companies learn more about their customers, provide personalized communications, and manage the customer experience from prospect to evangelist. Our proven strategies enable companies to attract prospects, engage opportunity, close more business, and service current customers with delightful marketing messages designed to build brand awareness and establish a loyal community. We help businesses transition into lean, efficient profit generating machines through a skillfully developed mix of Process Consulting, Software Implementations, Systems Integrations, Customization, Data Migration & Skills Training - with a focus on executive leadership development and consulting. Engage with Business Solution Partners, and our Executive Solutions Team will put your business under a microscope to diagnose areas where efficiencies can lead to greater margin. Let us pair your company with an ERP solution, and supporting apps and integrations that will meet the ever increasing demands of your modern global consumer. Subscribe to our personalized updates to receive information from Business Solution Partners that pertains to you. We make every attempt to provide you with useful, actionable information that will help you do business better. You can unsubscribe, or manage your subscription preferences at any time. Business Solution Partners has been helping companies succeed with the right mix of technology and strategy for over 30 years. Experts in the field of business process and change management, our team guarantees rapid SaaS implementations, customizations, execution, consultation and training.